A christmas tree is lit up and glistening in the snow that has fallen outside of the Landratsamt in Neustift, in the city of Freising, Bavaria, Germany. This is a picturesque shot of a quiet winter evening with undisturbed snow on the ground. A glowing christmas tree lights up the undisturbed snow around it outside the Landratsamt in Neustift, in the city of Freising, Bavaria, Germany. This is a classic christmas scene and could be fit for a postcard as it is night, but not too dark, the snow is freshly fallen on the ground below with just a light covering, and the Landratsamt looks deserted for the night, but also calm and peaceful. 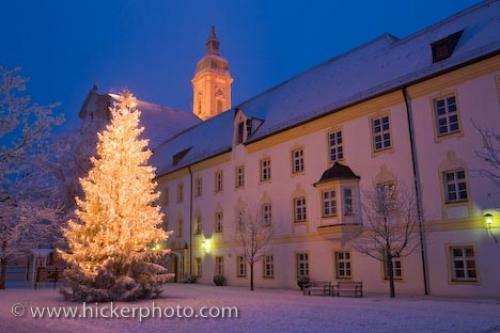 Photo of a Christmas tree outside the Landratsamt in Neustift, Freising, Bavaria, Germany, Europe. The Landratsamt is the district office or the office or administration for a city and this is where all the government buildings are located. In Bavaria, which has such a rich history and a history of ornate architecture, the Landratsamt is a historic building, as well as being an important one. As in often the case in older cultures, the government buildings can be some of the most glorious buildings in the whole city and anyone who is lucky enough to go inside would be stepping in to history as well. Christmas tree outside the Landratsamt in Neustift, Freising, Bavaria, Germany, Europe. I photographed this photo with the digital SLR camera model Canon EOS-1Ds Mark III, aperture of f/11.0, exposure time of 6/1 sec. on ISO 50, as always I used a original Canon Lens, the focus lenght for this picture was 32mm.